Since the Thirties the sisters Anna and Maria Avoni together with their brother Raffaele run the business of tavern and grocery store in the ancient farmhouse of the family, located in the pitoresque hamlet of San Pietro. The restaurant, also known as the "tavern run by the two old ladies", reopened in 1996 under new management. In a rustic and traditional setting are offered home-style dishes, like pasta and homemade desserts. 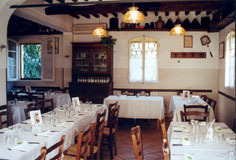 The website of the "osteria" indicates those dishes as local specialties: "tagliatelle al ragù" (hand made noodles with meat sauce), "tortelloni di ricotta" (hand made pasta with cheese and spinach filling) and "tortellini in brodo" (a broth with hand made pasta with meat filling). Also available "crescentine" (fried dumplings) with cold cuts and desserts inspired by the book of the "secret recipes of the great grandfather" (zuppa inglese, fiordilatte, semifreddo di mascarpone with chocolate chips, chocolate salami). The restaurant is listed as a “Bottega Storica” (historical shop), that is to say among the historical premises of Provincia di Bologna, qualification awarded to the activities in life for over 50 years, as a precious witness of the past and of the local traditions.